We have performed at corporate events for Volkswagen, Ikea, Lloyds TSB, Zurich and many more. Our experience ensures that we understand the need to be organised and flexible during the run up to your event and on the night itself. We will make sure your entertainment runs smoothly and will always represent your brand in a professional light. 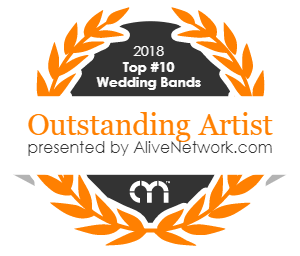 Once you’ve decided on us as the band for your event, you will have a dedicated event coordinator at our agency Alive Network who will be on hand to liaise with you on any issues, questions or concerns. We’ll be in touch around 3 weeks before your event to run through the details and finalise any last minute arrangements. After we’ve set up and sound checked we will put background music on through our PA system and go to change into our stage clothes. You will need to arrange for the venue to provide us with a secure changing room, and your catering to provide us with a hot meal and soft drinks/tea/coffee. This is standard for all bookings for any band. If we can't eat before the first set (EG: the event is behind schedule and we need to perform right away) - then we'll eat during our first break.